Thursday 7/26/2018: Mercury is Retrograde! The Capricorn Moon was going full speed ahead yesterday on its never-ending mission: to get things done! As of 9:41 AM ET, it may feel as if the wind has been taken out of the sails. Yes, we may feel an intense power play or catharsis, as the Moon just met up with ruthless Pluto. However, the Moon is now void until 6:41 AM ET tomorrow (FRIDAY). Roll with the twists and flakes that may derail your efforts to move forward in a straight line. Try to remember what day it is, challenging as it may be, given that Mercury is now officially RETROGRADE. If you are not at liberty to chill or wander, then you may need to make an extra effort to FOCUS FOCUS FOCUS…or suffer the consequences. Even if you know nothing else about astrology, you may have heard the term “Mercury retrograde” before. Often it’s accompanied by curses and groans, and that’s a shame. Yes, all of the flights on American Airlines might be grounded because of a computer glitch. Or the entire country of Finland might be offline because there’s a transportation strike. Or some trickster might set off all the tornado warning alarms in Dallas — these are all actual Mercury retrograde happenings. But there’s much good that can be accomplished when the Messenger Planet appears to be retracing its steps. Mercury—which in the language of astrology refers to mindset, travel and communication—will appear to move backward through the sky until August 19th. It’s not really moving backward, but that is how it looks from our perspective here on Spaceship Earth. Mercury goes retrograde 3-4 times each year, for a period of 22 days. 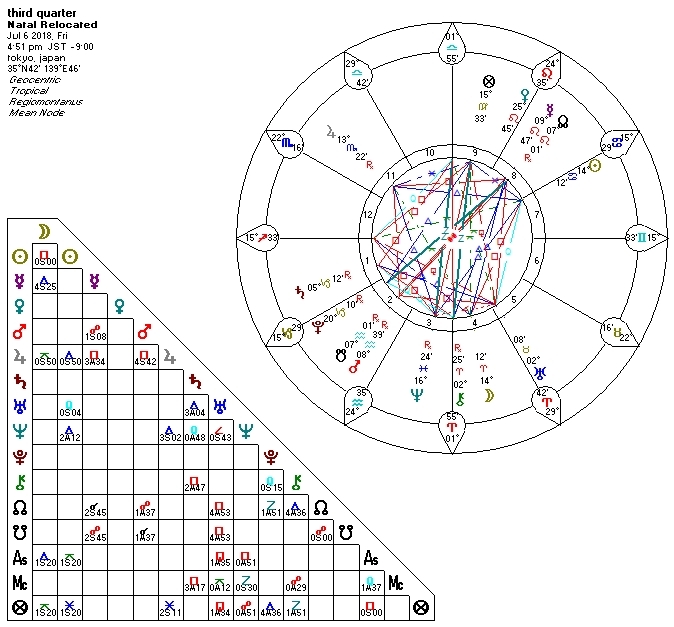 On WEDNESDAY at 7:34 AM ET, we’ll have a square between the Leo Sun (leaders, life force, willpower) and Uranus (disruption, technology, seismic activity, aviation, etc.). Already we are feeling the buzz. On THURSDAY at 1:03 AM ET, Mercury goes retrograde at 23 Leo, suggesting a review of how we need to think about play, showmanship, creative self-expression, regal pronouncements and entitlements. 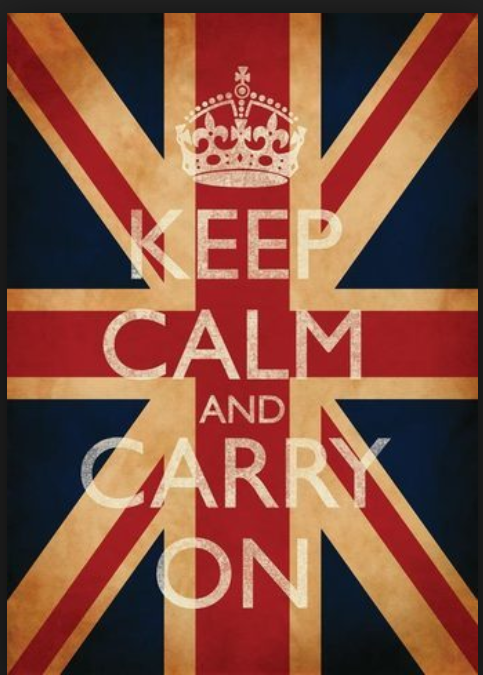 Watch the headlines over the next few weeks for stubborn and grandiose miscommunication. Don’t believe everything you hear! Mercury turns direct on August 19th at 11 Leo. If you have planets between 11 and 23 Leo — and especially on those exact degrees, you are especially affected by this Mercury retrograde. Regardless of your own unique horoscope, everyone should BACK UP YOUR COMPUTERS NOW! Other general guidelines for surviving Mercury retrogrades may be found here. On FRIDAY at 4:20 PM ET, a Full Moon/total lunar eclipse at 4 degrees of Aquarius — opposing the Leo Sun. How will we balance the eclectic needs of the collective vs. the birthright of the individual, hmm? The next exact aspect after the eclipse is a harmony between Venus (money, women, art, social expression and value) and Pluto (power, resources) on FRIDAY at 9:22 PM ET. Venus is in Virgo; Pluto is in Capricorn. These are Earth Signs — concerned with the material world. 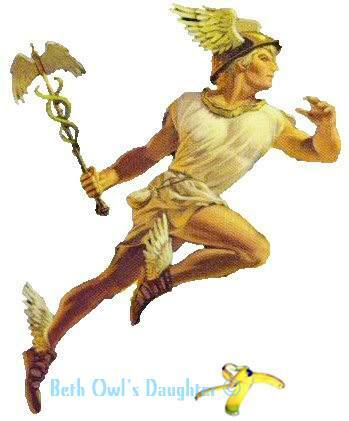 Virgo seeks discernment, perfection, cooperation, service, process; Capricorn seeks status, achievement, establishment. I zeroed in on this Venus-Pluto trine when reading Beth Owl’s Daughter’s always in sync Tarot Card of the Week. It challenges us to take serious stock of what we value and how we use it. With Uranus now in Taurus (material comfort and security), we see strong potential for disruption in matters we believed were rock solid. When will that start? I am not certain, but I suspect we will have taken notice by mid-2021, with a whiff of things to come around June 2019. And, as we are learning, a simple majority does not make the choice go one way or the other. Only when a Golden Mean (3/5ths) of our world’s population chooses the sacred over the profane version of something can we as a planet move fully past that particular choice point. And so it seems we are in the process of endlessly taking a step forward, and then back. Repeating it over and over again until 3/5ths of all the souls within our world agree on that step forward. Then we begin to tackle the next step. Other Moon voids this week: THURSDAY 9:41 AM ET until FRIDAY 6:41 AM ET. Well, that’ll make for an interesting first day of Mercury being retrograde. Of course Paul Manafort’s trial– scheduled to begin on the day Mercury turned retrograde — would be delayed. Duh. Other signs Mercury might be stationary retrograde: Fox “News” thought they’d booked Ann Kirkpatrick, a Democratic congressional candidate who does not favor abolishing ICE. Guess who showed up instead? Barbara L’Italien, a Massachusetts state senator who opposes P45’s immigration policies. Not that the anchors noticed the booking error…until they finally did. D’oh! But hey…confusion about an ideal woman (Venus-Neptune opposition)…a disruptive Sun-Uranus square…we can see how this would happen. Naturally the play I went to see last night was canceled, because the theater was on fire. Meanwhile, this week’s tension among Mars (retrograde), Sun and Uranus — which will continue into next week — coincides with exceptionally aggressive headlines with a technological spin. For example: DIY 3D-printed guns get go-ahead after P45 administration strikes court deal; multiple injuries and fatalities caused by a gun-wielding assailant in Toronto. Even the weather continues to be aggressive: dozens killed by wildfires in Greece; Sweden continues to burn; record heat (106 degrees) kills dozens in Japan; record heat in UK; heat wave warnings in LA. P45 administration considering using “seismic testing” to search for oil in Alaska wilderness…. …not to mention P45’s screaming ALL CAPS Twitter tirade, threatening Tehran. My money says he failed to read this offering from the NYT: “Ever Wanted to Get Revenge? Try This Instead.” And even if he did, it wouldn’t compute, given his horoscope. He continues on a path suggesting reckless action and communication. Last month it was a solar arc between Mars (action) and Uranus (reckless); next month it is a solar arc between Mercury (mindset/communication) and Uranus (reckless), exact August 19th. This Mercury retrograde cycle activates his Midheaven (public status) this week; on August 19th, when Mercury turns direct, it will allllll-most be exactly on his natal Pluto (power and resources). Something to consider when reading headlines about P45 considering stripping security clearances from people who say things about him that he doesn’t like. 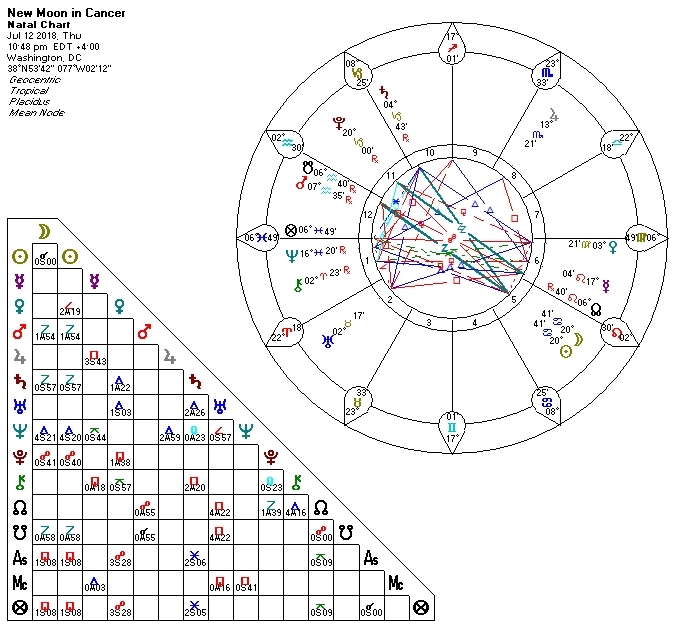 UPDATE: Stormy Daniels was served with divorce papers with transiting Mars exactly squaring her 4 Scorpio Moon. Her Moon co-rules her 7th house of partnership and will be affected by this week’s lunar eclipse. We can see the potential for a change in domestic/relationship status. Here is her horoscope. UPDATE: Geologists are now saying that lava will likely continue to flow from the Kilauea volcano in Hawaii “for months to years.” File that under “I told you so,” based on patterns in Hawaii’s horoscope. RANDOM FUN FACT: in May and June, the NYT and WaPo quoted twice as many Republicans compared to Democrats. Surprised? Perhaps this explains why Democrats are faulted for not having a clear message. RANDOM USEFUL ANALYSIS: James Hohmann of WaPo’s Daily 202 breaks down the facts about Carter Page and the recently released FISA warrant. Thank you for reading this forecast. To find out what all these retrogrades and eclipses mean to you personally, here’s the 411 on scheduling a consultation. To support my tireless efforts to report on the astonishing synchronicity of daily news and planetary patterns, here is the link to my Cosmic Tip Jar. With gratitude. 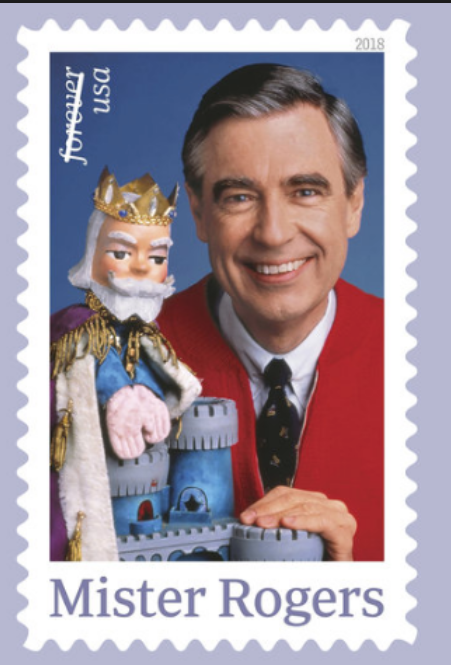 Which reminds me: Won’t You Be My Neighbor? is a must-see film — and a beautiful reflection of the potential in Mister Rogers’ horoscope — discussed on Friday. Hope you make time to see it. Aspects to the Moon on SATURDAY are also fairly smooth. There’s no Moon void to derail shopping adventures. Maybe a stubborn impasse around 4 PM ET, as Mercury in Leo squares that Scorpio Moon…. No sleeping in on MONDAY. The Sag Moon continues to give us something to talk about — e.g., a scandal or a dreamy ideal. Those options will be reflecting a face-off between a perfection-seeking Venus in Virgo and wallowing Neptune in Pisces, exact on TUESDAY. By then we’ll be feeling even more of the buzz of WEDNESDAY’s square between the Sun (leaders) and Uranus (disruption); Mercury retrograde on THURSDAY (BACK UP YOUR COMPUTERS NOW); the biggest, fattest total lunar eclipse we will see this whole century on FRIDAY, featuring a feisty Sun-Mars face-off and more consolidation of power, suggested by a harmony between Venus and Pluto. Going back to my metaphor anticipating that this week’s events would be like watching an ice shelf suddenly collapse into the sea, here is a clip of Dan Coats (Director of National Intelligence) hearing that the White House has announced that Vladimir Putin will be coming to the White House this fall. Congressman William Hurd (R-TX) is a former undercover CIA agent who penned an op-ed arguing that P45 is being “manipulated by Putin.” The silence from other members of his party is deafening…but let’s see what happens next week, with its assertive patterns. Israel’s horoscope was hit hard by the Big Fat Solar Eclipse of 2017, with its “get away with murder” Mars at 28 degrees of Leo totally eclipsed. We see the potential for an uptick in assertion and aggression. As I type, a new war in Gaza is escalating, something that one really ought to avoid during a Mars retrograde. Next week, the Big Fat Lunar Eclipse of 2018 will totally eclipse Israel’s regal Leo Moon. This suggests a big change of public status for its people, with extra provocation added by contact from transiting Uranus and Mars. Yes, I am really looking forward to seeing the Mr. Rogers documentary, Won’t You Be My Neighbor? With transiting Jupiter on his 15 Scorpio cusp of his 7th House, it makes sense that Mr. Rogers would be back in the public eye at this time. 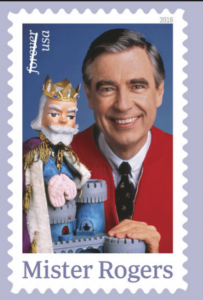 He even got his own stamp! Of course, with a 29 degree Pisces Sun at the Aries Point, naturally he would be famous for embodying the belief that We Are One. Oh, but he’d do it with his own quirky style, with his Sun conjunct Uranus in me-me-me Aries. A Mercury-Venus conjunction in Pisces adds to his need for idealism, along with a soulful Pisces Moon. His Taurus Ascendant needs to project an aura of material comfort and security — and don’t you think he does? Here is his horoscope, which lives forever, doncha know. Your mission this weekend is to arise, go forth and be a helper, inspired by the sweet sextile between the benefics, Venus and Jupiter. Thank you for reading this forecast — with extra special gratitude to Avid Readers Karen and Martha for contributing to my Cosmic Tip Jar. The energy of the day is brought to you by the Moon in Libra, seeking to be popular, fair and balanced. It will cruise without interference until a few hours before 2:43 AM ET on THURSDAY, when it will be challenged by ruthless Pluto. Power play or catharsis? Then more relatively smooth sailing until the First Quarter Moon at 3:52 PM ET. My advice: work with the energy of the late night Moon-Pluto square and use that emotional depth to facilitate harmony in relationships. With Mars now retrograde since June 26th, an urge to grumble at significant others is understandable. But is it really about them? Consider how your inner demons may be at play. Also consider this aptly-timed article: a bad marriage is seriously bad for your health. Of course you all remember P45’s horoscope for July 16th, yes? Here it is again. Monday’s Putin-P45 summit began at 1:12 PM in Helsinki. Looking at the chart for that moment for a meet-up, we see the two parties represented by 1) a detail-oriented, hypercritical, effective Venus in Virgo, buoyed by a harmony with expansive Jupiter and 2) an imbecilic self-immolating renegade Mars in Aquarius — wandering without focus, retrograde and about to self-destruct on the South Node. Now. You tell me — which planet represented which party? Right. And then this happened: “At Summit With Russia, Trump Betrays His Country in Plain Sight”. Because what U.S. president wouldn’t announce to the world that when it comes to espionage and efforts to sabotage our country, he’ll take the word of a Russian president over the facts presented by multiple U.S. intelligence agencies any day? And that was just one of many jaw-dropping statements. Here’s the full video of the Putin-P45 press conference, in case you missed it. And here’s a written excerpt, with flat-out falsehoods noted by the NYT. Meanwhile in Washington, over the past few days, 29 year-old Maria Butina was arrested and indicted on “charges of being a covert Russian agent,” as you will read in this WaPo piece: “‘She was like a novelty’: How alleged Russian agent Maria Butina gained access to elite conservative circles,” Note the connections between Ms. Butina and the NRA. But what was she doing at the National Prayer Breakfast? Getting back to P45’s Helsinki sinkhole…yesterday, during the much ado about nothing Moon void in Virgo, P45 tried to make things right by saying he “misspoke,” earning him a place — according to Stephen Colbert — “in the Lying Hall of Fame.” Watch this video and watch him lie about Queen Elizabeth. Then notice that that three minutes into the clip, P45 states, “I have a full faith in our intelligence agencies,” and as he says those words, the lights in the Oval Office go out. Coincidence or conspiracy? After researching possible causes for the sudden power outage, I warmed to a theory suggested in this piece from the NYT: “Supernatural Cleaning Methods,” (written for owners of haunted houses), arguing that lights going on and off without apparent cause might actually be reflecting the influence of an otherworldly presence. Hmmm…but who might haunt the Oval Office? A former occupant who is no longer among the living? How about….Ronald Reagan? Of course I looked at his horoscope to assess its potential for action yesterday around 12 PM ET in Washington DC. If any Avid Reader has an exact time for when those lights went out, please let me know. The lamestream media is hopeless when it comes to timing. 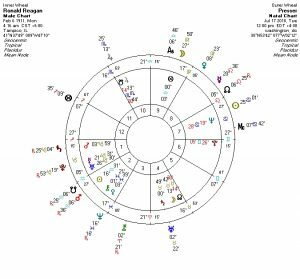 transiting Jupiter (ruler of Reagan’s Sagittarius Ascendant) is almost exactly conjunct his natal Jupiter and opposing his Taurus Moon (co-ruler of the 7th — the public). Transiting Moon almost exactly squaring his Ascendant and Pluto. Transiting Pluto is close to a conjunction to his natal Mercury and square his Libra Midheaven, suggesting a need for empowered and persuasive communication. Transiting Pluto is also exactly opposed his natal Neptune, ruler of his 3rd House (of mindset and communication). Hard transits between Pluto and Neptune are a reliable reflection of metaphysical/paranormal experiences. Transiting Sun is exactly opposing his natal Uranus — well, that’s a potential buzz…and transiting Uranus is conjunct his natal Saturn (another potential shake-up). with natal Mercury conjunct Uranus in his horoscope, we see Reagan’s need for a quirky and provocative sense of humor. Finally, transiting Saturn is almost exactly conjunct his Mars — we can appreciate the potential for frustration. Dear Avid Readers, I believe we have found our culprit. The horoscope lives forever, doncha’ know. The Gipper ain’t buying the gaslighting. And really, I don’t see why he would. Nor should you. Case closed. Astronomers discover 12 new moons on Jupiter; one is on a collision course with the others. I think we can all appreciate how that feels. As we approach Sunday’s harmonious sextile (an aspect suggesting cooperation and generosity), let’s close with one of the most uplifting stories I’ve read in a while: “An Alabama man walked almost 20 miles to his new job. When his boss found out, he gave him a car.” Not only did the aptly-named Walter Carr — literally go the extra mile(s) in his eight-hour trek in the middle of the night, but a police officer who questioned the 20 year-old African-American en route did not try to arrest him. Instead, he bought Mr. Carr breakfast and engaged the help of another officer, who gave him a lift six hours into the journey. But wait, there’s more! After arriving at his destination and doing a stellar job moving furniture from one household to another, the satisfied customer started a GoFundMe campaign on his behalf, which as of this morning had generated $37,000. A few days later, Carr’s boss gave him the car. Wouldn’t it be fun to see Walter Carr’s horoscope? I suspect we’d see it activated by last week’s two Grand Trines. I love that everyone in this story chose to be a hero, supporting and rewarding Carr’s noble cause. With today’s Libra Moon traveling free and clear, you, too can be a hero by appreciating and noticing the efforts of people in your life who are going the extra mile. The work week begins on note of optimism, suggested by a perfection-seeking Virgo Moon in harmony with expansive Jupiter at 11:34 AM ET. Grab that to-do list and make things right. As we get closer to 4:25 PM ET, double check the details and make sure communication channels are clear. Moon is opposed by nebulous Neptune, potentially fogging up the windshield. Dig deep for clarity around 10:29 PM ET, as the Moon harmonizes with ruthless Pluto. The Moon will be void on TUESDAY between 6:49 AM ET and 3:42 PM ET. If you must work, tend to routine concerns, and don’t get carried away by crises that may crop up. Chances are that after the void is over, that crisis will be revealed to be much ado about nothing. Chill! If you are free to wander during the void, then do so — and roll with the twists and flakes. Other Moon voids for the week: THURSDAY 3:52 PM ET until 9:13 PM ET — and that’s it. Guess what kind of week this is? A week with no exact aspects among the planets except to the Moon. Not until SUNDAY morning will we have an exact aspect among any other planet — a harmony between Venus and Jupiter, which may be experienced as sweet or otherwise indulgent. But still…I’ve found that these apparent lulls are often deceptive. Like I said last week, it’s like looking at a giant ice shelf on the most sparkling sunny day ever…and then, for no apparent reason, half the shelf crumbles into the ocean. So if an “other shoe” drops in the headlines, I will not be surprised, and neither should you. We do have a First Quarter Moon at 3:52 PM ET on THURSDAY at 27 Libra, activating the 2017 inauguration chart. On verra, as they say in France. Way to go, World Cup champs! Looking ahead to next week, please note that Mercury will turn retrograde NEXT THURSDAY at 1:03 AM ET. BACK UP YOUR COMPUTERS NOW! With a super-duper Full Moon and looonnnng lunar eclipse NEXT FRIDAY, which involve a release of tension among the Sun (will), Mars (action, assertion) and Uranus (rebels, aviation, accidents, technology), you will need to be especially FOCUSED during that time. Focus and PATIENCE are excellent coping strategies for Mercury retrogrades. First, you may remember last week’s off-the-top-of-my-head examples of a few famous people whose horoscopes were affected by the solar eclipse. Queen Elizabeth was on that list, and if you saw that video of Her Majesty walking with P45 at Windsor Castle, it was as if she had been eclipsed — and when does this ever happen?! Jared Kushner: we learned he STILL does not have a top security clearance, likes to exercise in the dark, and he’s being sued by tenants in one of his real estate investments. Add Sacha Baron Cohen to the list of the eclipsed. His 19 Libra Sun is already being hit by the empowering potential of transiting Pluto. He spent the past year traveling in disguise to interview truckloads of Americans, including many unsuspecting politicians and other power (!) players. Coming on the heels of last week’s Sun-Pluto opposition, his new show (Who Is America?) is filled with “news from underground,” and more than one of his interview subjects is howling with indignation by what has been revealed. This segment — in which past and present members of Congress vouch support for a program to teach toddlers about guns — is as dazzling and provocative as Cohen’s horoscope suggests. “The pheromone Blink-182?” They thought that was for real? Cohen is a Libra, driven by a drama king Moon in Leo. His Sun is conjunct Uranus; of course he needs to be a quirky rebel. With Jupiter and Neptune conjunct in Sagittarius, we need how he would need to push boundaries…but things may not be what they seem! With natal Pluto at the Aries Point, we can see why people of power would be prominent in his life. Birth time unknown — here’s what we do know about his horoscope. Obituaries often reflect the symbolism of planetary patterns. Here’s one for that enduring Earth Grand Trine: “Nancy Barbato Sinatra, Steadfast First Wife of Frank Sinatra, Dies at 101.” Indeed. What’s going on in your horoscope? How will this summer’s Mars and Mercury retrogrades be reflected in your own personal world? And what about these three eclipses? And OMG — Venus will be going retrograde on October 10th — in Scorpio. How will that period of REview manifest for you? Book a consultation and together we will plan a strategy to maximize opportunities. Here’s how to contact me. The Gemini Moon is void between 4:01 PM ET on TUESDAY and 1:59 PM ET on WEDNESDAY. That’s a time to chill and roll with whatever twists and flakes may derail your efforts to move forward in a straight line. Rolling with the twists may take you far off the beaten track in ways that are innovative and unconventional, courtesy of a harmony between Venus and Uranus, exact at 11:26 PM ET. After the Moon void, Moon enters Cancer, where it happily engages with Venus and Uranus around 5 PM ET. Note the potential for a wet blanket or an ambitious advance around 9:38 PM ET, when the Moon is opposed by Saturn. THURSDAY begins with that potent opposition between the Sun and Pluto (discussed further in a moment). The work day suggests vision and optimism on the table, with a catharsis or further power play scheduled at 9:43 PM ET, as the Moon follows in the Sun’s footsteps. The New Moon in officially begins at 10:48 PM ET, offering us an opportunity to re-set intentions and goals for the next lunar cycle. The most visible planet in the chart is Neptune in the 1st House, in contact with Midheaven and (loosely) the Ascendant. What is Neptune if not fog, vision, idealism, scandal, faith and deception? Operating behind the scenes – and running wild – is Mars (aggression, action, anger) in the 12th House (of self-undoing), about to meet up with the South Node for the second time in weeks. The South Node is a point of destruction, suggesting potentially toxic patterns that ought to be released. 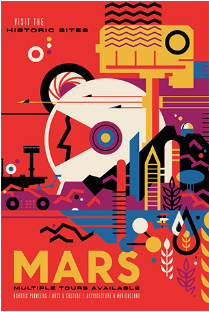 With Mars in Aquarius, perhaps the path of self-doing is related to rebellious assertion masquerading as freedom. There are two Grand Trines in the chart. One is separating – among Jupiter, Neptune and the Cancer Moon -Sun – all in Water signs. A Water Grand Trine suggests a need for emotional self-sufficiency; it also suggests being able to write your own rules and regulations, while everyone else marvels at how easily the world acquiesces. Neptune refers to faith; Jupiter refers to expansion, and also optimism, a.k.a. Hope. I am not the only astrologer to see this “belief in miracles” pattern reflected in the heroic success of the “mission impossible” to rescue the Thai boys from that underground (!) cave. The other Grand Trine is in Earth signs and involves Saturn, Uranus and Venus. To me, this suggests a need for material self-sufficiency, using innovation as a means for preserving authority – possibly to a fault – in matters related to women, money, values and aesthetics. This pattern of “haves” is reflected by a midpoint involving Jupiter and Pluto (the Powers That Be) and the Midheaven (public status/institutions) in this New Moon chart. This New Moon is also a partial solar eclipse. It will be visible mostly over water off the southern coast of Australia. A Solar Eclipse can act like a “bottleneck” of energy. Light flowing from the Sun is temporarily interrupted, focusing attention on that interrupted point, allowing something new and possibly fragile to enter the picture and grow. 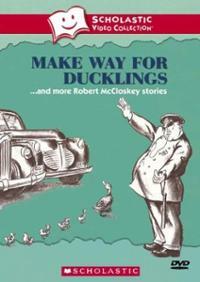 And here I would be thinking of Michael, the kindhearted policeman in the storybook Make Way for Ducklings, who stopped the flow of traffic on Beacon Street so Mr. and Mrs. Mallard and their brood of eight could safely make their way to the Boston Public Garden. Got that? Sometimes what is brought into focus is a secret suddenly brought to light. Once out, there’s no going back. In this eclipse , we have an opposition of the Sun and Moon to Pluto, ruler of the underworld. Plus, Jupiter has just turned direct in Scorpio, the sign that brought you #MeToo and other “resistance is futile” instances of abused power. My money says this month will bring even more to light. It ain’t over till (or until) the fat lady sings is a colloquialism which is often used as a proverb. It means that one should not presume to know the outcome of an event which is still in progress. More specifically, the phrase is used when a situation is (or appears to be) nearing its conclusion. It cautions against assuming that the current state of an event is irreversible and clearly determines how or when the event will end. The phrase is most commonly used in association with organized competitions, particularly sports. Hmmm. I find that hopeful. Astrologer Lynda Hill is another Sabian Symbol Guru. She suggests we see this prima donna image as an opportunity to use the voice to captivate an audience…with a caveat against hogging the stage. In the news, I will watching for prima donnas to take the stage and sing, supported by a group effort. UPDATE: British PM Theresa May, whose horoscope was last discussed here, is rearranging her Cabinet after the sudden departure of three who did not support the way she is handling Brexit. Ms. May is likely feeling the squeeze of three hits of transiting Saturn to her 8 Libra Sun. The last one happens on December 4th. Meanwhile, a measurement between her Sun and Uranus suggests she is more inclined to continue on her own path, regardless of the party-poopers. This measurement will be exact on October 2nd. What’s going on in your horoscope? Do patterns suggest a promotion for you anytime soon? If you have not checked in with with your astrologer in over a year, you are due for a consultation. Astrologers are like dentists, doncha know. Here is the 411 on consultations and reports. Yes, I am still offering the Mars retrograde special for $48.88. Thank you for reading this forecast and for sharing it with the rest of the Free World. The Moon continues in Taurus, seeking to build material comfort and security. The only aspect to the Moon is a challenge from Venus at 12:10 PM ET, suggesting a potential self-indulgent clash involving values and social expression. You could take an early lunch or Moon-void coffee break between 12:10 PM ET and 12:58 PM ET. By then, Moon will be in chatty Gemini, looking for a good story. Given that the day began with a challenging square between Mercury (how we need to think ) and Jupiter (expansion), we shouldn’t have to look too far. We are in the dark side of the Moon, getting ready to begin a new cycle. The closer we get to Thursday, the more listless and/or restless we may feel, sensing that something new is around the corner, though we don’t know what. Wrap up projects that were started on the last New Moon if you can. Consider your intentions for the next New Moon, exact on THURSDAY at 10:48 PM ET. This New Moon is also an eclipse and it is quite potent. Details below — with more later this week. MONDAY — Venus leaves Leo for Virgo, desperately seeking perfection until August 7th; it is triggering the Big Fat Total Eclipse we had last August 21st. If your horoscope was affected by the eclipse, it is affected by Venus today. TUESDAY — Jupiter, planet of reward, expansion and indulgence, turns direct at 1:04 PM ET at 13 degrees of Scorpio. If you have a planet around 13 degrees of Scorpio, Aquarius, Taurus or Leo, you are especially affected. Why? Because Jupiter has been sitting on that degree since the summer solstice, and will continue to sit on it for the rest of the month. What’s expanding in your life these days? If you’re former uber-conservative Senate Majority Leader Bill Frist (MD, R-TN; 2/22/1952 in Nashville TN), with Mars at 13 Scorpio, you might find yourself needing to take a moral stand with a surprising op-ed in WaPo entitled “The Senate I led put country over party. This one must do the same for Robert Mueller.” This surprising social expression would be motivated by transiting Uranus squaring your Venus at 1 Aquarius. Jupiter keywords include: collective belief systems, such as higher education, religion, political philosophies and the media; optimism, benevolence, inflation, bombast. Whereas Saturn restricts, Jupiter expands, for better or for worse — and this year’s expansion continues in Scorpio until November 8th. As you know, Scorpio demands substance, depth and control. Airy-fairy Libra theories of fairness and balance need not apply. Scorpio keywords include: debt, sexual/procreative energy, regeneration. Look for continued focus in these areas as Jupiter gets back up to speed. In a natal chart, Jupiter in Scorpio suggests a need to have a mission in life — zealously, perhaps. WEDNESDAY — Venus trines Uranus, favoring unconventional attractions and perhaps an innovative spin in matters of money, women and aesthetics. We’ll likely feel and see in the headlines the tension building to THURSDAY’s opposition between the Sun and Pluto. Major power plays behind the scenes, likely featuring heads of state. 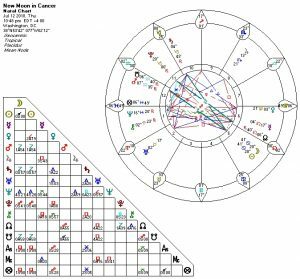 Sun-Pluto aspects also suggest news from underground, and the involvement of Pluto with this New Moon/Eclipse at 20 Cancer suggests more than the usual outing of secrets generally associated with an eclipse. You are more personally affected if you have a planet or angle around 20 degrees of Capricorn, Libra, Aries and especially Cancer. Off the top of my head, public figures affected include Jared Kushner (Sun at 20 Cap), FCC Big Head Ajit Pai (Sun-Jupiter at 20 Cap), Richard Simmons (Sun at 20 Cancer), Queen Elizabeth (21 Cap ASC; 20 Cancer North Node), Patrick Stewart (Sun at 20 Cancer), Gerald Ford (Sun at 21 Cancer — doesn’t matter if he’s dead — plus, transiting Jupiter is sitting exactly opposite his 13 Taurus Ascendant). 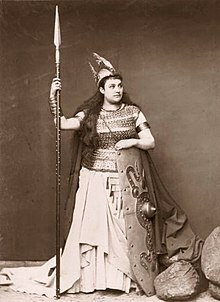 SATURDAY — Venus trines Saturn, suggesting grounded/sobering/serious news about women, money, arts and social expression. Moon voids for the week, other than today’s 20 minutes coffee break: TUESDAY 4:01 PM ET until 1:59 PM ET on WEDNESDAY; THURSDAY 10:48 PM ET until 1:31 PM ET on FRIDAY; SATURDAY 7:12 PM ET until SUNDAY 1:31 PM ET. If you enjoy reading these forecasts, as much as I enjoy writing them, I invite you to support the work by making a contribution to my Cosmic Tip Jar. Thank you for your appreciation! For more valuable insights on why you are the way you are, and what opportunities are up for you in the immediate future, book a personal consultation. If it’s been over a year since your last consultation, you’re due for a check-up. What all of that means may not be immediately known, as apparently no other American will be in the room to listen in on the conversation. Meanwhile, P45 is scheduled to visit the Queen on Friday the 13th. Apt? Perhaps for Her Majesty. Transiting Saturn will exactly square the Queen’s Mercury (how we need to think) around 4 AM BST on SATURDAY. Saturn in hard aspect to Mercury, suggesting a need for mental focus and heavy thoughts. Gravitas, indeed. There are four candidates being bandied about as possible SCOTUS contenders: judges Raymond Kethledge, Brett Kavanaugh, Amy Coney Barrett, and Thomas Hardiman. We don’t have birth times for any of them, but of the lot, Hardiman’s horoscope has the most visible action, followed by Barrett, Kavenaugh and Kethledge. But again — no birth times — so we can’t completely assess potential. While not as obviously active, Kethledge’s horoscope has interesting synastry with P45’s. Reflecting the “big ideas/communication” potential of Monday’s Mercury-Jupiter square, mixed in with the “news from underground” of the Sun’s face-off with Pluto: “A journalist’s conscience leads her to reveal her source to the FBI. Here’s why.” Fascinating. Extreme weather. Between last Thursday and Sunday we had a Grand Trine among the Sun, Jupiter (expansion) and Neptune (floods), a pattern suggesting excess. Record rainfall in Japan has caused severe flooding, landslides and mass evacuations. Scores have died. I wondered about a possible connection between planetary patterns and Japan, and ran a chart for Friday’s Third Quarter Moon, set in Tokyo: 4:51 PM JST 7/6/2018. There is a connection! 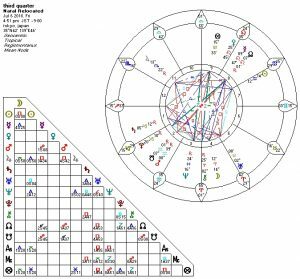 I could not help but notice the difficult relationship among Neptune and the angles of the chart, as well as the positions of the Sun and the Moon. 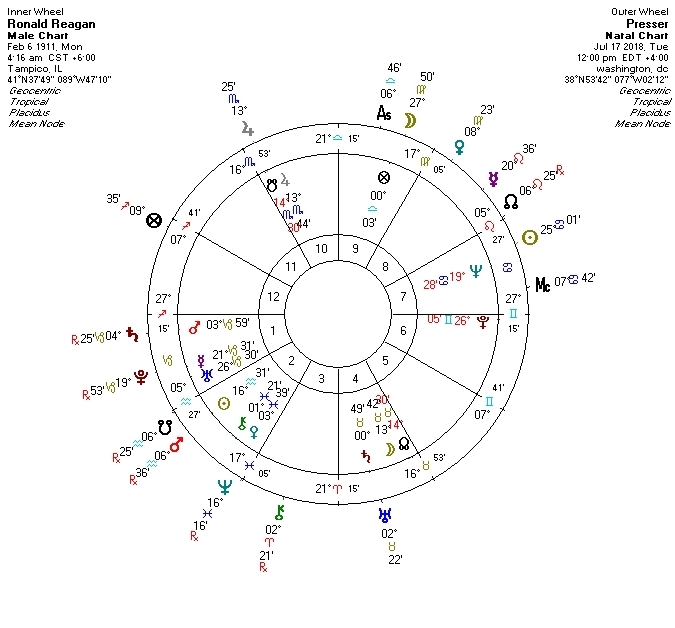 Perhaps an Avid Reader in Japan will want to comment on it….and take a look at the chart for the June 28th Full Moon chart set in Tokyo, too. Arigato gozaimasu!